Virtual Reality used to be something people imagined for the future or read about in comic books. Now, this technology is available to a much larger audience. It seems that these headsets fall into one of two categories: the super expensive and high quality or the very low quality and inexpensive. However, the Pansonite 3D VR headset has been designed to bridge this gap between inexpensive and high quality. This headset device has a stunning design and comes complete with built-in headphones for a full VR experience. This headset is for users who desire a quality VR experience without spending a full paycheck on the Oculus or Samsung models. 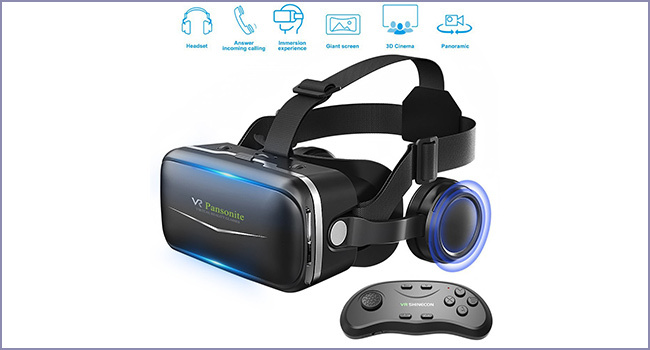 The Pansonite 3D VR headset stands out amongst competitors in its price range. 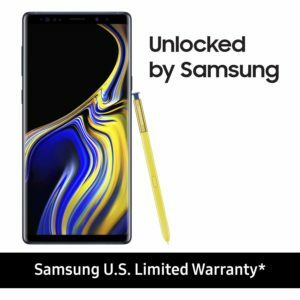 First and foremost, the overall build of the device is much higher quality than could be expected around this cost. The leather pads for additional comfort and the sleek design put this headset on a level of its own. Another unique feature is the built-in headphones that are of high-quality and construction. This addition won’t be found on similar headsets. Affordability: One of the greatest benefits of the Pansonite 3D VR Headset is the reasonable price tag. High-quality VR headsets usually run at higher prices. Ease of Use: This headset has an easy setup process so you can get to enjoying a VR experience faster than normal. Built-in Headphones: A lot of VR headsets in a similar price range forego built-in headphones. The Pansonite includes studio-grade headphones for no extra cost. Limited Use: While some headsets can work with more than one device, the Pansonite 3D is only compatible with smartphones. The Pansonite 3D is designed like a standard VR headset, with a few unique additions. There is a compartment in the front of the device to hold the phone in place. A headstrap wraps around the back and top of the head to hold the viewer. It can fit any size up to 175mm x 85mm or phones with screens up to 6.3 inches. The Pansonite 3 features a leather pad surrounding the viewer and a deepened nasal bridge for a comfortable fit. The built-in headset is studio quality and features thick padding around the ears. The Pansonite 3 requires a phone with a 4.7 to 6 inch. screen. It works with iOS or Android smartphones. Pansonite designed this headset with an HD resin, aspherical lens for high-quality viewing and an overall impressive VR experience. The lens has a diameter of 40mm in total. Users have a field of view ranging from 90 to 120 degrees, which is the equivalent to some much more expensive headsets. The IPD or Inter-pupillary Distance has an adjustable range of 60 to 70 mm. This makes it easier to put the picture in focus. The Pansonite 3D also has a fixed focal length of 37.5 to 46.5 mm. The Pansonite 3D VR headset has an impressive resolution to complete the overall VR experience. The Pansonite 3D VR headset also comes with an ergonomic controller. 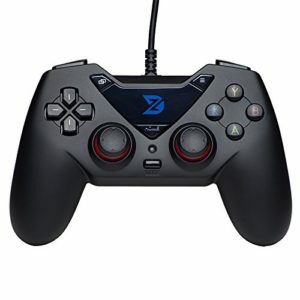 It is designed to fit comfortably in the hands and is designed similar to an Xbox or Playstation controller. There are primary buttons on the right side with a toggle on the left. The movements on the controller are designed to translate seamlessly to movements in the VR world. The controller is wireless and requires batteries to function properly. Another great feature of this headset is the easy setup process. All of the plastic wrapping should be removed once the device is taken out of the box. Users should check to make sure that all of the required items are there: VR headset, headphones, controller and instructions. Next, the head strap should be untangled and adjusted to fit the proper size of the user. This step is easier if another person can help make the adjustments. Users can then open the front compartment and place their phone with the screen facing the lenses. The handheld controller connects via wireless technology and is able to control games and other actions within the VR experience. User #1 – This is one of the best virtual reality headsets in this price range. I have used the Oculus Rift and Samsung models and been blown away. However, I have only ever owned much cheaper models that weren’t that great. The Pansonite 3D brings together a high-quality VR experience with a lower price tag. User #2 – This device creates a really impressive VR experience. The headphones really help to create an immersive environment. I’m also very pleased with how comfortable the headset is to wear. The padding along the outsides help to keep the device from becoming too irritating. 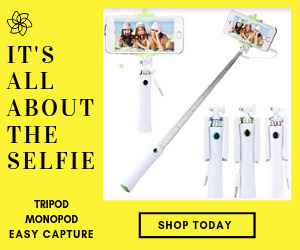 User #3 – If you’re on the fence about buying this product, I would vote for yes! I have been skeptical about cheaper VR headsets in the past. However, the Pansonite 3D VR headset really exceeded my expectations. It is affordable, but it still is excellent quality. The Pansonite 3D VR headset is a great option for those looking for an affordable, yet high-quality virtual reality experience. With Oculus and Samsung producing options for hundreds of dollars, many people feel as though a good VR experience is out of their price range. Pansonite has the answer to the cry for a cheap headset that still packs enough quality to make it a worthwhile VR experience. Unlike many VR models, this headset only requires a standard smartphone to function. It is affordable, easy to use and a lot of fun. This is the best VR headset for the price.